A lot of places had stagecoach inns at a time when the mail was delivered via a stagecoach, and it took priority over passengers. Often, their feet would rest on top of the overflow of packages and letters bound for other destinations. Certain seats had the best ride, and others could jar the rider to pieces. Stagecoach robbers were prevalent, and that’s why they had a man riding shotgun atop the wagon. Most times, robbers only wanted the passengers’ valuables, and didn’t want to kill anyone. One of our friends had an ancestor who had robbed a stagecoach back in the day, and had been caught and hanged, though normally, it wasn’t done. Why the hanging then? One of the passengers had died from a heart attack during the stagecoach robbery. And since the robbers had given him the fatal heart attack, they were tried for murder. 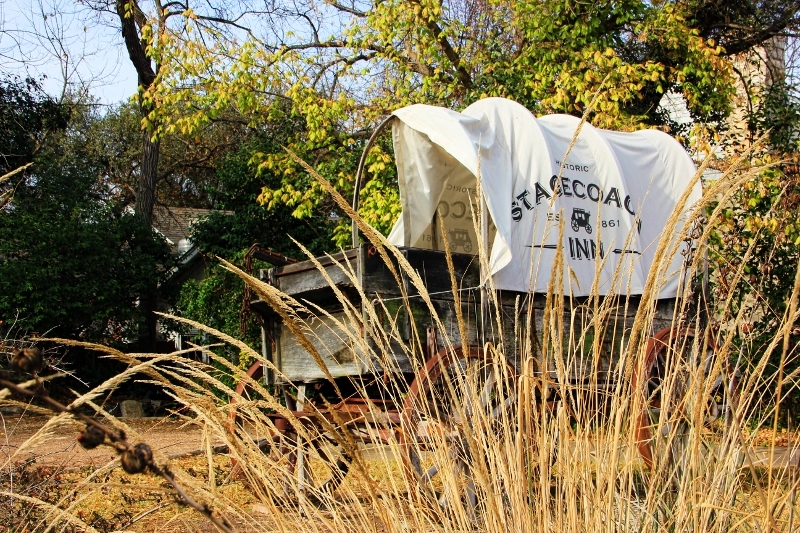 This is actually a covered wagon, with the Stagecoach Inn sign. This hotel was originally called The Shady Villa Inn. Not only did those in the United States travel in covered wagons from the east coast to the west, they did the same in Canada. I was reading about some of my ancestors in Canada traveling from Ontario and further west in covered wagons. I find all of that stuff fascinating! This is the covered wagon–playground style. 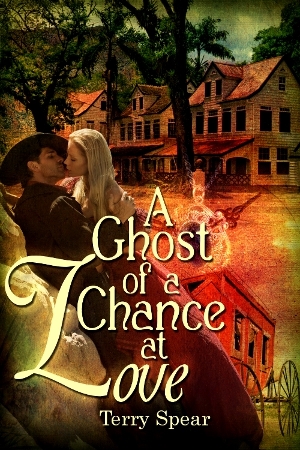 I actually used this in A Ghost of a Chance at Love, the story set in Salado, Texas. She sees it in the present day Salado, but when she wakes up in the past? It’s gone! Just think of all the things you’d miss in the past??? 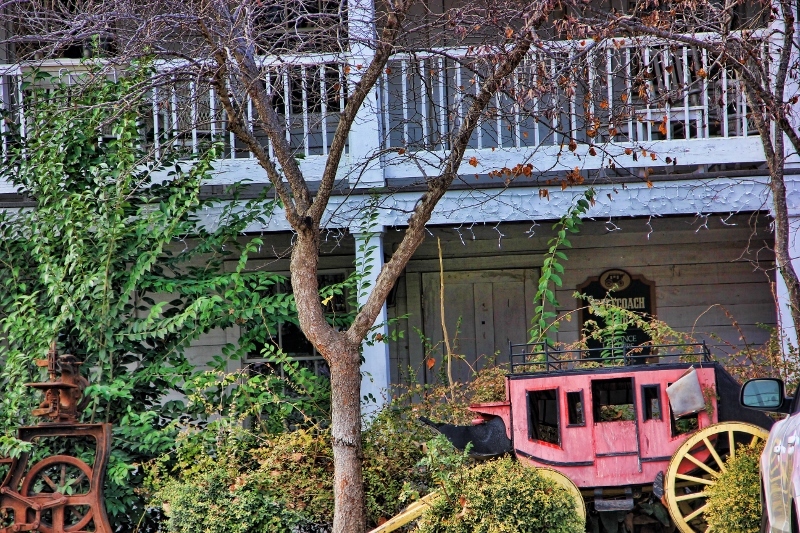 And here is a miniature covered wagon in front of the Stagecoach Inn. I love going to Salado. Some places make me feel I’m at home. Others, don’t. But when I go to Salado, I enjoy being there. So I wondered what it would be like to travel back in time, not a planned trip at all. A woman spends overnight at the Stagecoach Inn and finds her world turned upside down–murder, ghostly aberrations, (which several buildings there claim to have), a man in her bed who doesn’t belong, and who claims this is HIS room. All the modern day changes would be undone, and somehow she has to find her way home again. Not just home to Waco, Texas, but to the same time before she traveled to the past. I write romances, so I can have the action, adventure, paranormal, ghostly stuff, but it’s still got to have romance. Soooo, every woman who ends up back in some distance time-travel past needs a guardian angel, right? The ghost, and murder, and mysteries continue to haunt her. And there’s only one way to right the wrong. If she doesn’t get herself killed in the process. Anyone ready for a trip back in time?